Annual herb, native to Central America. Plant names of Mexican indigenous cultures (bitter gum, white bitter herb) point to the traditional use as remedy for stomach-ache. 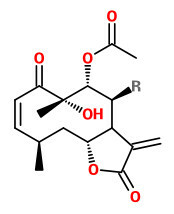 The herb contains sesquiterpene lactones of the germacranolide type (responsible for the bitterness) and flavones.